Adopting property surveillance cameras is an extremely important decision that can help ensure the most important assets, property, and people are kept safe and protected twenty-four hours a day. A home surveillance camera system can provide peace-of-mind against an uncertain world by deterring criminals, protecting against external threats, and alerting you when an emergency occurs. This means that choosing the right surveillance camera system for your home is an important decision that takes time and consideration to make the best choice for your property. Surveillance security cameras come in a wide range of designs, sizes, types, and with various functionalities and capabilities that benefit different circumstances and environments. Since there are a number of residential security surveillance cameras on the market one of the most important determinations to make is finding the home security cameras that are best suited to the security requirements of your home. What can make this choice difficult for most consumers is that there is more to property surveillance cameras than just the cameras and those considerations must be factored in. 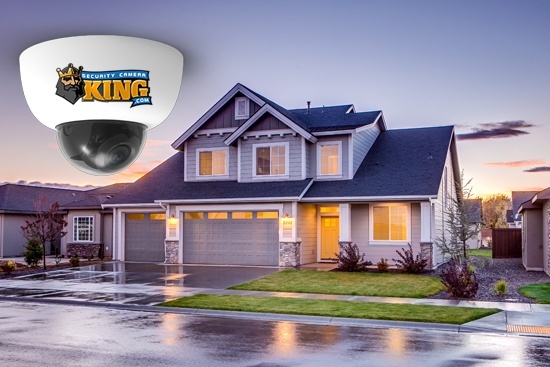 The following article will highlight everything you will need to know about purchasing and adopting a residential security camera system for your home and the considerations you should make to ensure you receive the most benefits from the system you choose. If you require further assistance finding the best home security cameras to adopt into your video surveillance system then be sure to contact our team today. Understanding what your home surveillance requirements are is the first and perhaps most important step in buying a new video surveillance system. This will help you find the most ideal security surveillance products while saving you time and money spent comparing security cameras and their related components. Does your home require property security cameras inside and outside? What level of night vision surveillance does your home need? Do you need security cameras equipped with a microphone? Does your home require twenty-four/seven video recording? Will your home require a new Wifi network as well? There are a vast number of security camera designs that come in all shapes and sizes including the associated recording devices. By establishing what your home’s security needs are you can help reduce the vast number of choices available and find the most appropriate options so that you can make the best purchase and choice. Property surveillance cameras are capable of so much more than simply recording video and their individual designs and functions work best in certain conditions and environments. Similar to home security surveillance cameras, video recording devices come in a wide range of designs, only function with certain types of video surveillance cameras, and can only store a certain amount of recording space. By learning the different types of security surveillance cameras and their intended uses you can find the right model that can provide the very best security and protection for your home and family. It is also important to consider the different features that these cameras provide which could eliminate the need for adopting more cameras than your home may need. One important component of any property surveillance cameras to consider is the type of lens that is used. Some lenses are designed for long-range surveillance in dark environments while others are specifically designed for surveillance of a small room, for example. If you require assistance in choosing the best lens for your circumstances then be sure to use this helpful CCTV Lens Calculator to establish the perception and scope you need to capture. Finding the right scope and perception you need will ensure that the home security surveillance camera you choose will be able to capture the video images you need no matter the environment or circumstances. Another important consideration in choosing the best home surveillance cameras is your video storage options. This will determine how much space you will need to store the video recorded by the security surveillance cameras. Some homeowners choose to have their property surveillance cameras only record when the cameras detect motion and are then activated. Other homeowners may want to consider twenty-four-hour surveillance monitoring of their property, which comes with its own requirements. It is important to keep in mind that depending on how much recording takes place will determine the video storage option you may need. For instance, the space needed for twenty-four/seven recording is much greater than that needed to record only when a camera detects motion. The more storage space required will mean a much more expensive video management device is needed to properly store all the captured video. That is why it is very important to determine what your space requirements will be which will keep you from spending more money than necessary. If you require further assistance determining your video storage needs than be sure to use this helpful CCTV Hard Drive Calculator to get an estimate on the hard drive space you’ll need. Aside from the lens and video storage requirements, there are a number of different features which are important to consider when adopting property surveillance cameras for your home. Although some of these features may seem complicated and even futuristic, each provides important functions which can add to the security of your home. Contact us if you would like to speak with an expert about finding the most appropriate products to achieve your security goals.